The art of giving life to the inanimate is a vocation that the European puppeteer Carles Cañellas has. 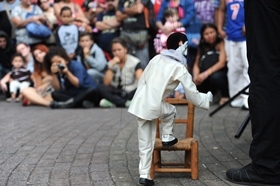 With a joint strings and virtuous hands, this Catalan stages a street show of marionettes, be able to maintain without blinking for more than an hour adults and children. This is who were tested today at noon in the Plaza de la Cultura, where the puppet show Soloist, of the Rocamora Company from Barcelona, was presented. The show came to the Costa Rica as part of the cultural activities of the International Festival of Arts. What makes these marionettes so special? The difference with other puppets of its kind is that these characters are appropriate the stage by circuses acts, ballet, flamenco and other dances, performed with such perfection that it seems that the figure of the puppeteer disappears momently of the scene. Cañellas reminds us that he is on the stage only when calling their stars, which come out one by one from their suitcases. The first to appear is a tap dancer named Johnny, a likeable black marionette, who is one of those who show the most perfect technique. However, who wins the show is a marionette created by the Spanish that he calls only Grandpa, and despite his rheumatism makes rumble the stage with his dance. Meanwhile, the esplanade of the Plaza de la Cultura looks very crowded. Some of those who pass by chance come to snoop on what keeps everyone so entertained. These bystanders end up staying, thus forgetting the chores of the day for a few minutes. Gifting culture. Part of the cultural contribution made by Carles Cañellas and his partner Susanna Rodríguez, who helps him on stage, is the presentation of a piece of ballet starring by a marionette with mime’s air, which he says, has been accompanying him on his travels since 1979. The piece takes the audience on a dramatic moment showing the exploits of a dancer to reach a star. After this act, comes the turn of the last puppet, who accompanies him on this trip to Costa Rica: a gypsy dancer, called Pepita, who plays the castanets and moves to the best style of the Andalusian flamenco. Soloist closes with the repetition on the stage with the Grandpa’s marionette, who takes the audience laughs at their attempts to learn to skate. This show ends when the artist behind the strings greets and expresses the hope that they do not pass another 20 years before to return to Costa Rica with their puppets. The puppeteer has given one of the most intense moments of the festival. Marionettes of a prodigious agility and a summer evening outdoors. There were so many ingredients on the fourth edition of "Alla corte di Tavà", the Festival of Puppet Theatre that last night, has experienced one of his most intense moments. The program had already indicated "Soloist", the spectacle of the Rocamora company of Barcelona, such an important event. To observe at Carles Cañellas operating with his marionettes arouses the emotion that is felt for a true master. The Catalan puppeteer shows a virtuosic, almost acrobatic technique, combined with a strong poetic sensibility. His puppets, from the cute little granddad on roller-skates to the exuberant flamenco dancer, to the poetic Pierrot, they looked living his own life. The audience’s attentiveness and the final applause have emphasized the general appreciation. “Soloist” of Carles Canellas was the one who started the official opening of the 8th International Puppet Theatre Festival “Pierrot 2013”. There is no doubt if it is the kind of a play, which successfully synthesizes and represents the puppet theatre that we all exude deep in our selves. 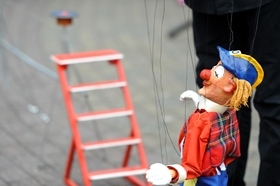 The attitude (we could name it love) of the actor towards the puppet, the correlation between an actor and a puppet, and the life of the marionettes as a whole are the core of the play. A play, cleaned from everything needless, a play which fits in a trunk, a play, where the whole beauty of the puppetry is collected in one, on top of that performed only by one actor. Carles Cañellas shows his puppets to the audience in seven different acts, mixing shorts stories with dancing pieces. 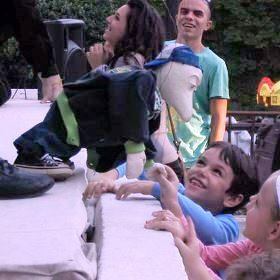 What makes this simple play so unique is the love towards the puppetry which Carles presents. In his hands all puppets become alive, so alive that it is hard to talk about them as simple puppets. Actually when watching we forget that they are puppets. We meet up with real little people who dance, dream and have feelings. For the audience is like a personal live mirror, in front of which they get in the vortex. We could hear them breathing and when we see them how they relate with the actor, now we are sure that they are alive. Each of the characters has his own little story. It all begins with a puppet, which comes out of a suitcase. It leads us to an endless journey through the puppets’ world. When Johnny’s step dance is interrupted because of a technical problem, he decides to go up on the stage and show us what he is capable of. The audience is in rapture. 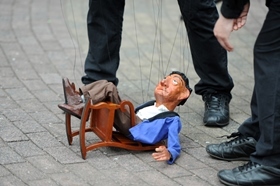 And to prove the autonomy of the marionette, the grandfather forces his partner Carles to let him on the stage so he can get his minute of fame. We could also feel the fear of the clown Felix when he is balancing on a rope. Then it’s the turn of Mendelssohn and Schumann and Pierrot who’s dreaming to reach the stars. He pursuits the stars in his dream - a dream full of tenderness. We could only stay quiet and share his rush towards the stars. And the flamenco dancer -Pepita Repuerto- gives her everything on the stage. The impressive dialogue between the actor and the puppet creates a sensation of things happening right now, unexpectedly. At the end Carles turns the marionettes towards the audience so they can meet them closer, just before he puts them in the trunk until the next time. Teodora Kafedzhieva / Teodora Marginova. Appreciated Cañellas exhibition with the show "Soloist". Opening the festival was the company Rocamora with Soloist. It's about a marionette show of the Catalan animator Carles Cañellas. The structure is simple: using a diffuse formula, especially abroad, the show is composed by a sequence of «sketches», whose protagonists are the characters who interact with the puppeteer. It’s a form that winks to the old variety show and that is lent from the art of «buskers», the street performers -acrobats, fantasists, dancers, clowns-. Except that is performed with puppets, furthermore «at view». And here begins the difficulty, because if the structure is simple, the technical skill requested is remarkable. There is no a story in which to hold on or a curtain behind which to hide. The operator is alone, in front of the audience. From this point of view, Soloist is a show-assay of technique that should be filmed and shown in the animation schools, if there were in Italy. Cañellas conquers the audience, displays an exceptional dexterity giving to the marionettes movements almost humans. He plays with his own role, alternating moments where is involved in the action with his puppets with others where he limits to animate, literally «disappearing» from the public attention. He also touches the virtuosity, when one of the marionettes hides between her legs, and he continues moving it without to tangle a string or to lose the rhythm. It’s a piece of cleverness comparable to when Gassman recited upside down the Hamlet's monologue at the Teatro Tenda in the 70s: but that one was virtuosity of exhibition, this is functional to the show.